If you love nipping down to the corner shop by bike, or if you’ve transported your new bed by cargo bike, or if you use your trailer as a supermarket shopping trolley – as long as it’s Shopping by Bike – send us your experiences, ideas or handy hints – and you could win a great prize plus some modest fame. Whether you’ve a great idea that would help other people, a challenge you’ve overcome, an experience you’d rather forget, or something you’d not recommend – if it’s about Shopping by Bike, we want to hear from you!! An important factor in judging will be how useful your idea is, but interesting or unusual ideas or stories could also help you win a prize. Your entry must fit an A4 sheet, but apart from that it’s up to you. Words alone are fine, even just one superb sentence, but a picture, diagram etc often adds value to an entry. Most years at least half of all entrants get either a prize or at least a runner-up map! As with all our recent competitions, entries will appear on our website (anonymous except for prizewinners) and hopefully will inspire more cycling and more innovative uses of bikes! Prizes include the great selection below – several of which will help you shop by bike! The top winner gets to choose their prize from the list, second chooses second, and so on. For detailed rules, prizes, how to send in your entry, and other information, download the entry form – here in pdf or Open Office [.odt] and Word 97 [.doc] formats. Please do read the rules carefully before entering. The competition closes on Monday 5 September. Each person is allowed 2 entries. Important – This is a locally-based competition. Your entry must be based in Edinburgh or the Lothians if its location is in any way identifiable. 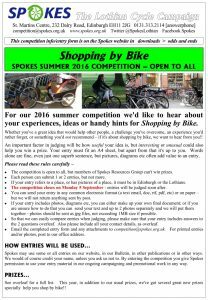 Judging will be by Spokes Resources Group, assisted by an outside expert. For further fun and inspiration have a look at our competitions page which has the results of previous competitions, such as cycling jokes, cycling recipes, and how I’d spend £1m to get more people on bikes. Results of the 2016 competition will also appear on that page once the results are announced in September.